USD/JPY reached the HFT selling zone! We are analyzing the activity of HFT algorithms today and have noticed that the USDJPY currency pair has reached the light HFT selling pressure zone that is noted at 110.62 and above. 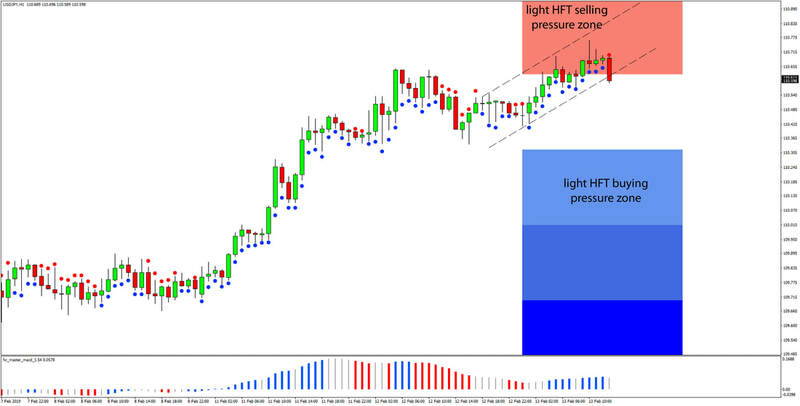 The price has already started to react after entering the light HFT selling pressure zone and there are some bearish patterns forming on the 1-hour USDJPY timeframe. We can also see that the pair is trading inside of a rising channel (as shown on the chart below) and a bearish breakout of this channel could just be the trigger for a larger move down. The Master MACD indicator just now shifted to bearish but the FxTR CCI is still showing the trend as bullish. In this potential bearish scenario, once/if a bearish breakout of the channel occurs, USDJPY can move lower toward the light HFT buying pressure zone that is today noted at 110.32 and below.